Frances Faviell lived in Chelsea before and during the London Blitz, having became a Red Cross volunteer when World War II began. Chelsea was particularly heavily bombed and the author was often in the heart of the action, witnessing or involved in fascinating and horrific events through 1940 and 1941. Her memoir evokes an unforgettable cast, Londoners and refugees alike, caught up together in extraordinary and dangerous times – not forgetting the ‘Green Cat’, a Chinese statuette, standing on the author’s window sill as the home’s talismanic protector. Frances Faviell’s memoir is powerful in its blend of humour, tenderness and horror, including the most haunting ending of any wartime memoir. 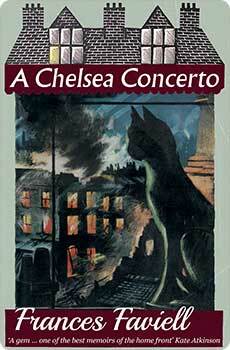 A Chelsea Concerto is reprinted now for the first time since 1959, with a new introduction by Virginia Nicholson.